The Academy of Nutrition and Dietetics designates March as National Nutrition Month. 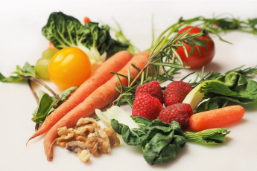 It is a great time to focus on the basics of a healthy diet and set goals to be healthier. It is important to keep in mind that a healthy lifestyle doesn’t happen overnight. If you pick one or two goals to work on now, you can focus on them for several months. Then, when you feel you have mastered those goals, you can select one or two more to work on. The following five tips for setting healthy lifestyle goals comes from USU Extension “Eat Well Utah” blogger Candi Merritt. Eat a variety of healthful foods from all food groups. MyPlate tells us that everything we eat and drink matters. When you eat from the five food groups, you are more likely to get the nutrients your body needs. If you find yourself eating the same handful of meals and snacks every week, try expanding your range of food choices by making it an adventure. When grocery shopping, select a fruit, vegetable or whole grain that is new to your family. Be mindful of portion size. Serving sizes and portion sizes don’t always align. Become familiar with the differences. Children and teens may enjoy exploring more about the program “We Can” from the National Heart, Lung and Blood Institute website. (See: https://www.nhlbi.nih.gov/health/educational/wecan/eat-right/distortion.htm ) Once you understand proper portion sizes, pull out measuring cups or a food scale to see how your portions add up. Getting the right amounts of the right kinds of food is an important part of a healthy eating plan. Keep it simple! Eating right doesn’t have to be complicated. If you are new to the world of nutrition and creating a healthy eating style, you may feel overwhelmed. Start by following MyPlate and you’ll see how simple it can be. MyPlate is built on six simple principles centered around the five food groups. (See: https://www.choosemyplate.gov/start-simple-myplate#resources). There is no fancy diet name for this plan and it is science-based from the USDA. For more information from the Academy of Nutrition and Dietetics, visit: https://www.eatright/org.